How many points are a Premiership goal worth? 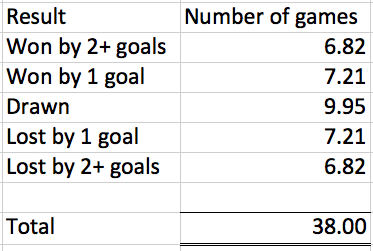 We know that not all goals are created equal, the third goal of a 3-0 win seems like it’d be somewhat less important in the grand scheme of things that the third goal in a 3-2 win, but how can we go about putting a value on the worth of a single goal? Well finding the extreme high and low values is pretty simple. 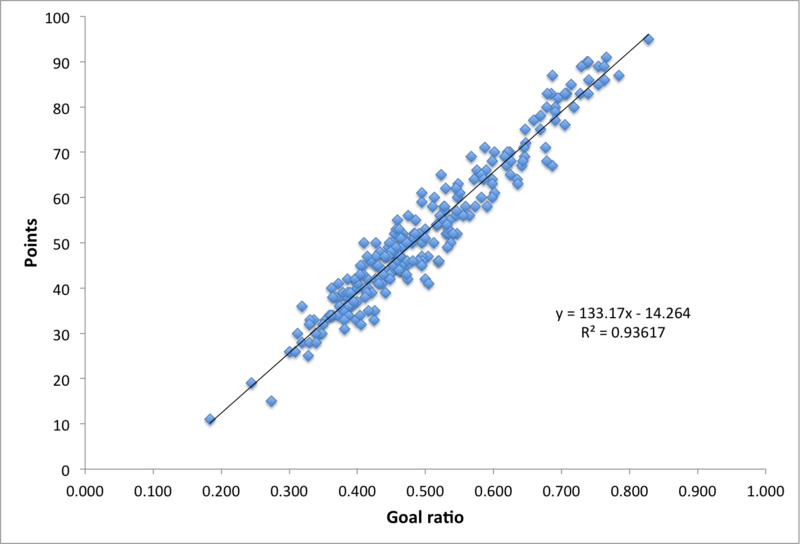 The high watermark is found by dividing the number of points scored in an average season (1042) by the number of goals scored in an average season (1003), to conclude that a goal is worth 1.04 points. That’s all well and good but what about 0-0 ties – in theory al of the goals could be scored in a single game – and 758 points (379 x 2) would be won without a single goal being scored. Therefore the goals would be worth only the three points scored in that game, and 3 dvivided by ~1000 is essentially nothing. Logically neither of those scenario’s is true, and the truth lies somewhere in between, but how can we go about assessing their value in a smarter way? Well one logical way would be to plot season points vs goal difference and determine the slope of the best fit line. That plot is below, and suggests a goal is worth about two thirds of a point. That looks pretty sensible, what about if we use goal ratio rather than goal difference? In the 2011-12 Premiership season the average team scored 53 goals and conceded 53 goals, for a goal ratio of 0.500. Let’s give that average team an extra goal, meaning they score 54, concede 53, and have a goal ratio of 0.5046. 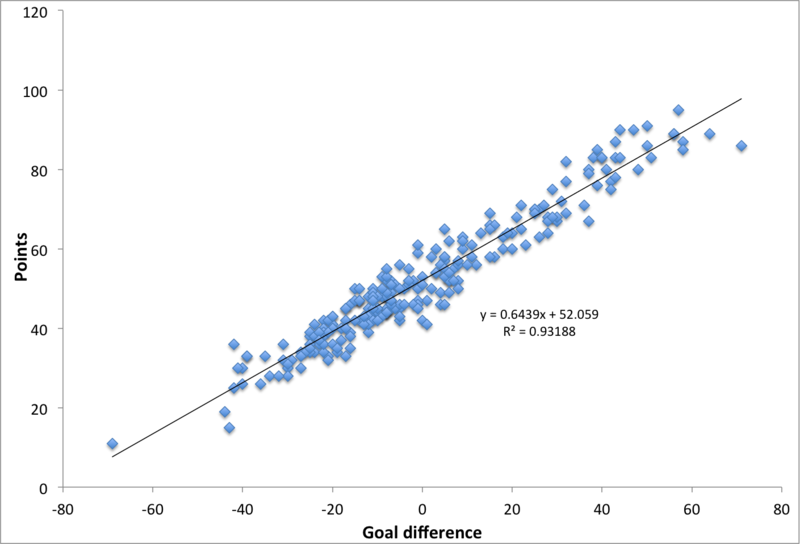 The best fit line above suggests that a 0.0046 increase in goal ratio should correspond to ~0.61 points. And if we divide 27.11 by 38 then we find that a goal was worth, on average, 0.71 points, which matches pretty nicely with what we saw above. But not all teams are equal – and the spread of results is likely to be different for good team than bad. For example we’re more likely to see a good team have more wins in that top group of 2+ than bad ones. However a team is really only gaining points here in games that finish with a draw or a one goal defeat. Is one group of teams more likely to be involved in more of these games, and if so are goals more valuable for one set of teams than the other? I’ve picked two examples, both of which combine to 12 seasons worth of data. The ‘bad’ team was a bit tougher, but to get twelve seasons of data I went with a combination of Sunderland and Derby. Together they’ve averaged 35 points per season, had only one season with an above-average league points total, and been responsible for the three lowest single season point hauls in Premiership history. How realistic or accurate this methodology is is certainly debatable, but it certainly passes my initial sniff test. It suggests that a goal for the ‘good’ team is worth a mere 0.45 points, whereas for the ‘bad’ team a goal is worth 0.76 points. And, logically, this makes sense – bad teams are more likely to draw or lose by a goal than good teams so we’d expect their value to be higher. I think there’s a pretty compelling case to be made that an average goal is worth somewhere between 0.4 and 0.8 points in the league standings. To give that a little more context I’ve previously estimated (very crudely) that a Premiership point is worth £2.4-4.7 million, so we could also crudely estimate that a Premiership goal is worth £1.2-3.9 million. For some solid reasons I suspect the spread in monetary value of a goal is nowhere near this large, but I’m pretty confident that it falls within these bounds. The first transfer of >£1.2 million only occurred 34 years ago, and now that’s the minimum that I’m suggesting a single goal is worth. To me that progression is simply staggering. It looks like goals matter more in MLS. My hypothesis is the increased parity of the league (Max GD: 28, Min GD: -35) means that teams are closer together in talent and a singular goal is more likely to turn the result of the match.